Thanks to this list, I never get bored with breakfast! Here's a master list of Trim Healthy Mama breakfast ideas – with tons of Paleo! SO MANY great THM breakfast ideas, all in one place! I'm always looking for ways to make our meals even better – different types of oatmeal, different shakes, more exciting ways to make eggs, etc. I already had a post on 31 breakfast ideas, but I thought I could really use a new and updated master list of Trim Healthy Mama breakfast ideas that I can refer to when I'm making my menus – and I wanted to share it with you! One of my favorite tips for meal planning is to repeat breakfasts throughout the month. If your kids know that Monday is oatmeal day, there's no hemming and hawing in front of the refrigerator in the morning, no complaining about breakfast, no wasting valuable time – actually, all of those things can still happen, but it definitely helps to know what's on the menu! But even if you use the strategy of a set breakfast menu, there's nothing wrong with adding some variety within the menu. For example, for a THM breakfast we'll eat oatmeal on Mondays, eggs on Tuesdays, waffles on Wednesdays, shakes and smoothies on Thursdays, and sausage and egg scrambles on Fridays. I like to make something special like a coffee cake on Saturdays, and use leftovers from that for Sunday. These meals are all gluten-free and sugar-free, and all work for Trim Healthy Mama (the recipes are categorized by S, E, and FP, which are Trim Healthy Mama categories, but if you don't know what those mean you can still enjoy the recipes!). Some of the recipes below are from the Trim Healthy Mama Cookbook, which is excellent for weight loss and healthy eating for the whole family. Most of the meal ideas below (if not all) also work for Paleo diets, although in a few cases you may need to sub an ingredient. I hope this list of THM Breakfast Ideas is helpful to you! Enjoy! 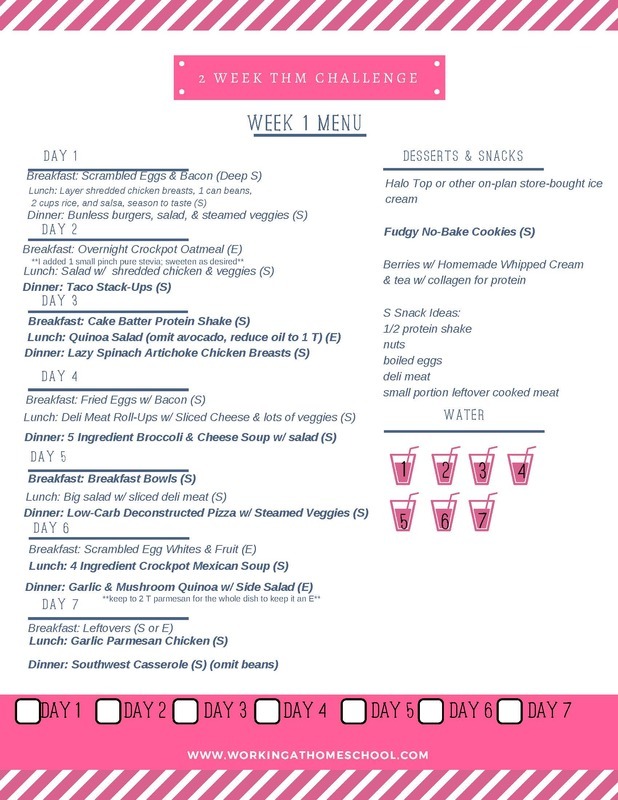 I'd love to share my meal plans with you! Sign up for your free complete menus and shopping lists here! « New eBook coming soon! Hi Dana! Over the next month, I have ultimate lunch and dinner lists coming – but for now, I do have 31 lunch ideas and chicken and beef recipe round-ups. I hope that helps! I think those new lists are going to be awesome; I’m more than halfway done compiling them and I can’t wait to share! This is an awesome list! Thanks for including some of my recipes! Hi Vangie! In a nutshell, S is low-carb and E is low-fat. But there are foods that aren’t good for you or approved on THM. I really recommend reading the book to get a clearer picture. Hi there! I am new to THM and am trying to see if some of the foods we love are on plan. So far you website has been beyond helpful. How do I tell if something is acceptable on plan? Specifically Kodiac Cakes. If not, how can I make them work on plan? They are my husband’s favorite. Hi Heather! The first thing to look at is whether the ingredients are on THM’s food lists or not (those are found in the THM Plan book). Unfortunately, Kodiak Cakes have sugar and wheat flour, which don’t work on Trim Healthy Mama. But there are lots of fantastic pancake recipes that do work on plan!